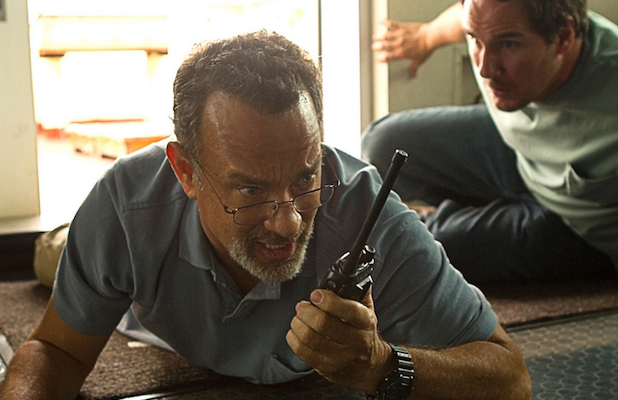 Through no real fault of his own, Paul Greengrass has become a victim of his own success. His work on the Bourne series has been so widely and often poorly copied that the public's perception of the genuine article has been damaged without the film-maker in question putting a foot wrong. Green Zone could and should have been a really big hit, but audiences stayed away because of bad experiences with 'shaky cam' on Taken and elsewhere. 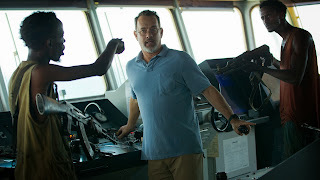 Now, three years after Green Zone failed to find an audience, Greengrass is back in full force with Captain Phillips, a film that contains all the aspects of his style and approach to film-making which make him so special as a director. Greengrass' unique aesthetic is perfectly suited to the tense and fascinating story, and he is aided brilliantly by one of Tom Hanks' very best performances. Ambitious in intention and near-watertight in execution, it is one of the best films of the year. In my review of Taken, I argued that the problem with 'shaky cam' was not so much the aesthetic in itself but that many directors didn't understand the motivations for using it. In Pierre Morel's film the effect is jarring because the action is so artificial and tightly choreographed: the film is using it as a gimmick to make something generic appear more spontaneous and realistic, but it only succeeds in confusing the audience and making the film look like a cheap imitation. While Morel and his counterparts are trying to apply documentary techniques to the taut choreography of genre film-making, Greengrass is at heart a documentarian who is interested in human drama. He goes to great pains to capture a story as it is happening, imagining his film crew are reacting to events as they transpire, with no time to plot out how a given shot may move or how long it may last. The aesthetic puts the audience right in the midst of the action, and by extension in the minds of the characters, as we respond to the events in real time just as they do. When it works, as here and in his other films, you get a film which is professional but also visceral, with a spontaneity that few Hollywood thrillers achieve. That's not to say, however, that Captain Phillips is dependent on its aesthetic to tell its story. The build-up of the film is very slow and steady, in which the camera movements are more relaxed and Greengrass' choice of angles more deliberate and judicious. Our introduction to Tom Hanks' character doesn't have the glamour of the introduction we might get to him if the film were being helmed by Stephen Spielberg or Ron Howard. But neither does Greengrass over-egg the realism by thrusting it down our throats: both the introduction to the title character and the first scenes with the Somalis are just allowed to unfold and are captured in an unfussy, low-key way. This opening is ultimately very fitting in light of the intensity that follows once both parties are on the open sea. It creates - if you'll pardon the pun - a calm before the storm, a sense of normality which puts our characters' travails in context. 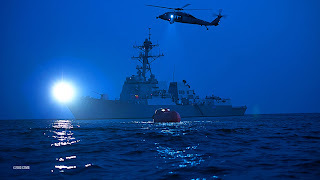 It makes it feel like a drama instead of a gung-ho Hollywood action-thriller, which a cold opening on the piracy may have implied. The normalities facing our two main characters are very different in terms of status and security, but they do have a common characteristic. Both men are worried about their work and the future, about being able to stay ahead in a world that's moving so fast and seemingly against their favour. Captain Phillips is a film that's interested in globalisation on many levels. It explores the ruthless, sink-or-swim mentality of modern capitalism, in which money and resources are the prime motivations and human life is negotiable in the face of material gain. Both Muse and Phillips are under immense pressure on a scale of supply and demand: Muse must bring back bounty for his masters, while Phillips must keep to a tight schedule to deliver valuable commodities along the coast. Both are participants in a larger game which dehumanises them, the only difference being that Muse's bosses are more direct in telling him that he is expendable. The film also explores how power is distributed in our modern economy, specifically the way in which globalisation has distanced, deferred or obscured power. Neither captain is ever fully in charge of the ships they command: they are dependent on the people below them to obey, but also answer to higher, more amorphous forms of power in the form of their distant superiors. In a world governed so unconditionally by the laws of supply and demand, national borders are increasingly irrelevant, and where there is confusion over who holds power or where such power lies, anarchy (such as in piracy) can gain a foothold. While Greengrass doesn't offer a grand ideological alternative for this economic system, he is keen to point out and spark discussion about its more inadequate aspects or consequences. When Phillips first reports the skiffs approaching the Maersk Alabama, the international authority asks him to prepare his hoses and follow lock-down procedures - to which Phillips replies: "Is that it?". 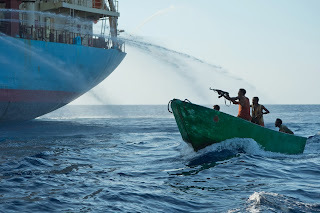 Greengrass is making a point about the efficacy of international co-operation, something which is both unhelpful in preventing the initial attack and paramount to rescuing Phillips. It may be the US Navy who eventually diffuse the situation, but the UK MTO provides the intelligence needed for the operation. 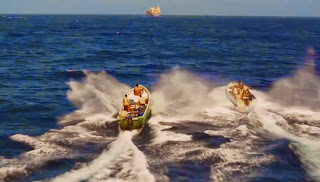 Later in the film, Phillips says to Muse: "There's got to be something other than being a fisherman or kidnapping people"; Muse responds: "Maybe in America". There are comments throughout the film about the rich nations of the world using their might to reap the resources of the developing world, and the lack of accountability they have from the system being built in their favour. Greengrass is certainly critical of the inequality of life that capitalism generates, and the extremes to which seemingly normally people are being driven. 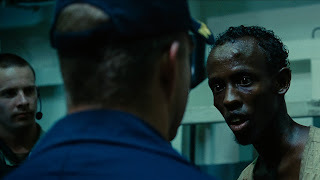 Even if you don't take an interest in its nuanced political discussions, Captain Phillips is still a brilliantly tense thriller, which holds its nerve right to the very last frame. 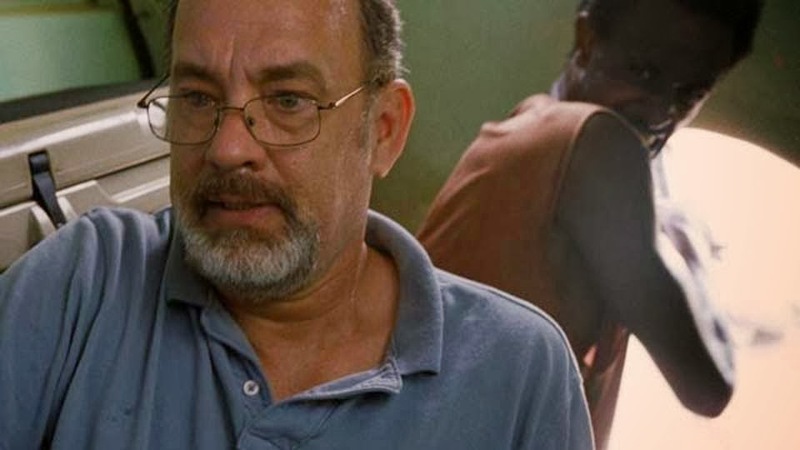 Christopher Rouse, who won an Oscar for The Bourne Ultimatum, edits the film with a ruthless intensity, refusing to let a single shot go on any longer than is necessary, and thereby sustaining the breathless pace we reach when the ship is boarded. Henry Jackman's score is subtle and unobtrusive, always underscoring the mood of a given scene rather than telling the audience how they should feel. 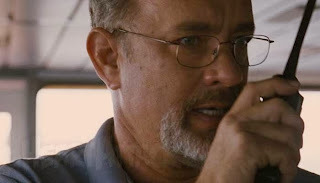 The plot of Captain Phillips is one that will keep you guessing, and like any good Hitchcock thriller it makes the best use of all the props available in a given setting. The frequency with which power shifts or changes hands, particularly in the claustrophobic lifeboat scenes, serve to deeply unsettle us, so that even the tiniest movement or request for water can seem like an act of great violence or aggression. The rescue mission is very well-orchestrated, with Greengrass keeping the human story at the centre in amongst all the military jargon and hand signals. In short, this is the film that Zero Dark Thirty should have been for more than just its last 20 minutes. Alongside its technical brilliance, the film is served by two fantastic central performances. 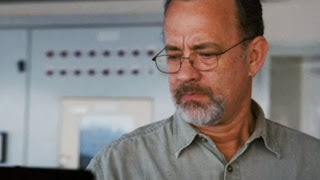 Tom Hanks is great as the titular Captain, allowing his bright, trustworthy reputation to pull us in and then creating a character of great guile and several surprises. 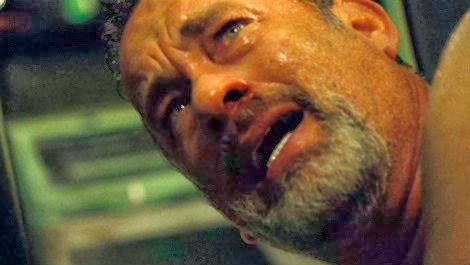 The final sequence is as emotional as anything Hanks achieved in Cast Away, and it could just be his best all-round performance since The Green Mile. 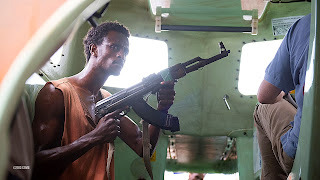 Equally good, however, is Barkhad Abdi, who leaves a lasting impression as the pirate captain Muse. While calling him the villain of the film is overly simplistic, it is a deeply intimidating performance, and as good a film debut as you are ever likely to see. Captain Phillips is a brilliantly tense and intelligent thriller which handles its meaty and complex subject matter with all the aplomb we have come to expect from Greengrass. 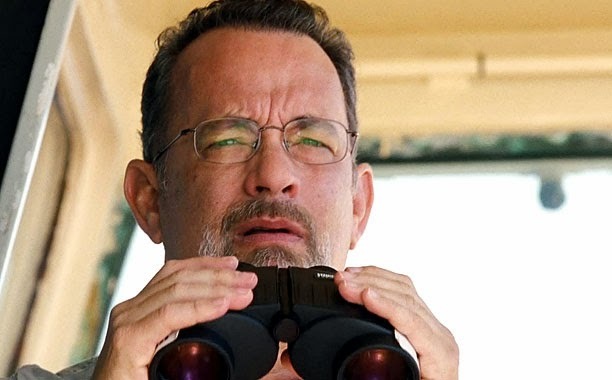 While not quite as immaculate or as exhilarating as The Bourne Ultimatum, it is desperately hard to fault it on both intention and execution, from its main cast to the tiniest technical detail. In short, it is one of the best films of the year, from one of the truly great directors of our age.